You can really get hurt by what you can't see coming. Blind spots and no-zones occur where a driver cannot see when driving in his or her vehicle. While driving, you want to limit your blind spots while making sure other drivers, especially trucks, are able to see you. Just about any passenger vehicle will have a blind spot, which are parts of the road that the driver cannot see when they are looking forward. Turning your head to keep looking at blind spots is not an effective strategy because it takes both your eyes and concentration off the road. One thing that may be able to help is "fish-eye" mirrors. Driver-side mirror - With your hands on the steering wheel, lean your body to the left. Adjust your mirror so that the car shows up on the inside edge of the reflection. Passenger-side mirror - Lean your body to the middle of the vehicle. Adjust the mirror so that the right side of the car is on the inside edge of the reflection. Then, while driving, ensure your adjustments are done well. The vehicles going past you should be reflected in your outside mirrors before leaving your rear-view mirror. 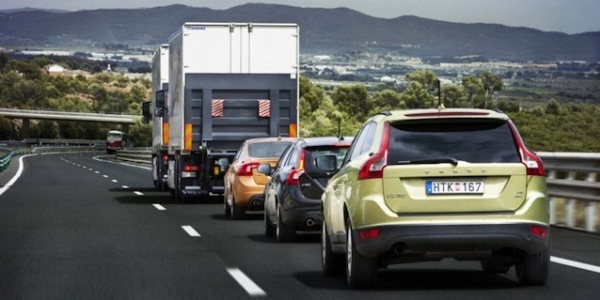 These simple adjustments won't 100% eliminate your blind spots, but they will certainly allow you to see more, which makes you a safer driver. If you think your car's blind spots are troublesome, you'd feel bad for a truck driver. The no-zones of a truck are the areas to the front, sides, and rear that cannot be seen by the driver. Since truck drivers cannot see much to their sides, it creates a dangerous situation for lane changes. Tailgating a semi-truck can be especially dangerous because the driver cannot see you, and you have a significantly reduced field of vision in front of you as well. 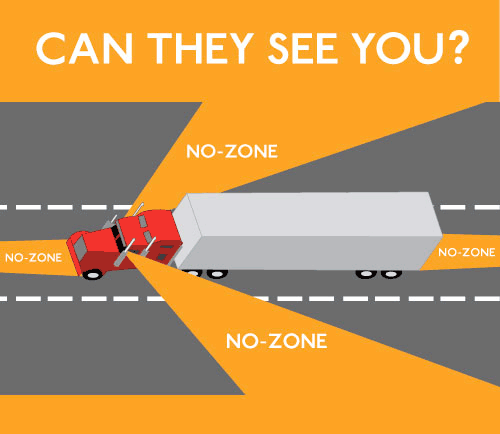 When driving close to semi-trucks, you must always know about these no-zones. You should also know that if you are unable to see a truck's mirrors, the driver likely cannot see you either. Lastly, when you have to pass a truck, do not cut back in front of the truck too soon and then immediately slow down. It takes a while to pass large trucks, so when passing, make sure the truck shows in the reflection of your rear-view mirror before you change into its lane.